I’ve written in the past about the differences between passive and aggressive job search and networking tactics. And generally, I consider the use of social networking sites to be more passive than aggressive, no matter how much time you happen to be pouring into them (::coughcough:: Twitter ::coughcough::). But Brazen Careerist — perhaps the only other social networking site I devote much time to — has figured out a way to take things a step further without requiring me to double fist large glasses of wine in order to get to a place where I feel comfortably chatty. I was then randomly matched with other professionals participating in the event, and had up to 3 minutes to chat with each person before being connected with the next one. The site made it extra easy to follow up with people later on by providing me with a network dashboard that recorded every person I’d been connected with. Lemme tell you, it was the fastest hour I ever spent, and I got the chance to chat with people I may not have chatted with otherwise (because even I sometimes fall prey to the Social Media Trap Marian Schembari describes so eloquently right here). 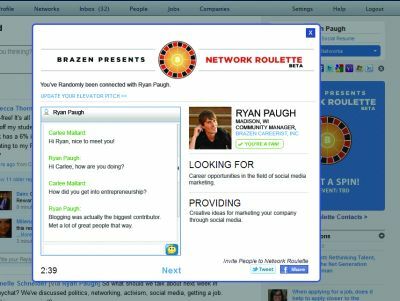 Starting today, Network Roulette is available for use at any time on the Brazen Careerist site, and BC also plans on hosting topic-specific events. Check out this nifty video to learn more. Of course, I feel as if networks become even richer once you take those contacts from online to in-the-flesh. But we’ll talk more about that tomorrow. Nice! Signed up and plan to try it tonight!